Mobility is an issue that affects everyone. Today, a large variety of means of trans­­port are considered a matter of course. Whether in their leisure time, in business travel or tourism – people appreciate rapid accessibility by car, bus, train or plane as an integral part of their quality of life and a prerequisite for the smooth functioning of business transactions. In the future, it will no longer be possible to ensure mobility through one single transport mode or one particular techno­­l­­ogy, but the focus will be on interlinking various modes of transport. How will people move from one place to another in the future? For reasons of cli­­mate protection, the optimum solution can only be one that is not based on private cars. Cities without any cars are no option for the time being, but fewer cars are. A fundamental change in transport ha­­b­­its will occur in the future. To guarantee a high level of mobility and the related quality of life, it will be necessary to con­­nect all types of transport to form an in­­tegrated transport system. The project “Perspektive 2030” (2030 per­­spective) addresses the development of mobility and communication until 2030. If we time travel to the year 2030, we will find ourselves in a much denser and more metropolitan city of Munich. Hous­­ing is characterized by modern, energy-saving high-rise buildings, expanded con­­structions of post-war modernism with additional levels as well as renovated old houses. Nevertheless, as much green space as possible has been preserved: Floor space, infrastructure and green spaces have been re-designed in a bal­­an­ced proportion. 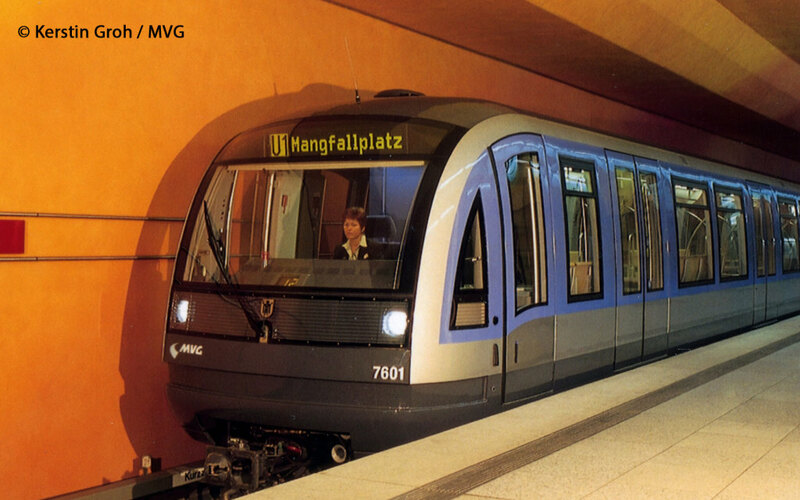 Thanks to the restructured transport net­­work, Munich has become a “city of short distances”. The links between the city of the future and the surrounding region are getting closer. Due to a strong influx of migrants to the Munich area, more and more people move to neighbouring towns and villages. As a consequence, commu­­­t­­er traffic will increase further. Because of the limited road capacity in the city and the rising petrol prices, many commuters depend on public transport. By 2015 alone, the traffic in the Munich area will increase by about 15 per cent. To cope with the large amount of traffic, attractive alternative means of transport are provided. The population must be encouraged to switch from using private motor vehicles to pub­­lic transport or to non-motorized travel, for example by bicycle. Transport hubs en­­able people to conven­­iently change from one mode of transport to another. An in­­termodal transport sys­­tem interconnects the various modes of transport and allows speedy travel. A wide variety of services are provided at trans­­fer points, for in­­stance luggage and bi­­­cy­­cle storage or gas­­tronomic facilities. There are good connections between the towns and villages outside Munich, which also have access to the nearest regional centres through centrally located local train stations. Each of the latter is connected with the neighbouring centres and with the core of the metropolitan region, the city of Munich. There is a high-frequen­­cy short train service between the centres. A comprehensive rail network for suburban and regional trains, which run frequently until late at night, makes it less attractive to use the motorways. Motor­ways are beginning to be converted to railways. Environmentally friendly measures such as commuter tickets, car sharing schemes, shared taxis or walking busses for school children are promoted. The increased use of electronic communication devices, which are getting ever more affordable, may result in reduced travelling activities by members of low-income households. In addition, those families are likely to use more economic modes of transport, such as bicycles. 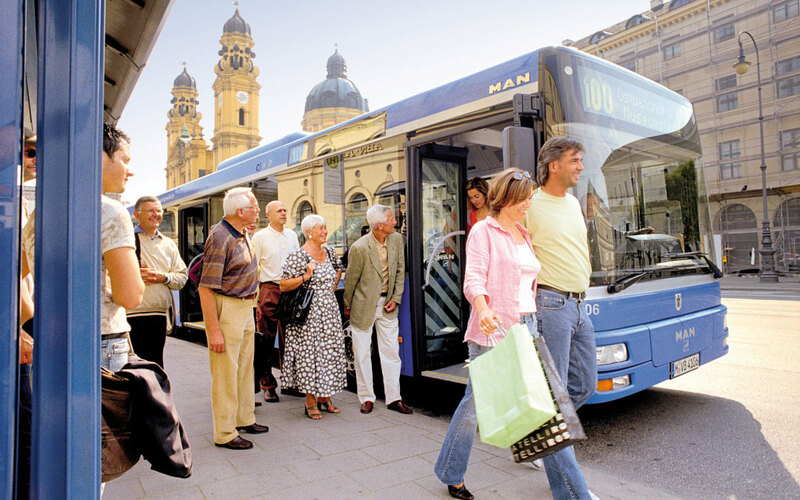 To realize this vision, the transport and mobility policy of the city of Munich has made the principles of sustainability and efficient use of resources the focus of its attention. The spatial structure is con­­sistent with the idea of the “city of short distances”, and the urban development concept is in line with the motto “compact-urban-green”. Certain signs of overloading are caused by the growing number of people working and living in the metropolitan region and the related increase in commuter flows, particularly with regard to private motor vehicles. The expansion of the transport systems, the modernization of traffic ma­­n­­­agement systems and the coordination and inte­­gration of different means of trans­­port are measures that should help to avoid increasing the pressure on the existing structures. To implement them, innovative approaches and creative fun­­d­­ing solutions are necessary. Cooperative project teams devise concepts and innovative strategies to main­­tain and improve the mobility of all road and transport users while ensuring that these measures are compatible with other urban development requirements. The Innzell Initiative is a joint project of the state capital of Munich and BMW, where representatives of politics, business, science and administration discuss traffic-related issues and develop possible solutions. The “Mobinet” project, sup­­ported by the Federal Ministry of Edu­­ca­­tion and Research, originated here. During this project, which ended in 2003, partners from industry, academia and gover­­n­­ment developed future-oriented political and practical concepts. The focus was on shifting road traffic to public trans­­port systems, optimizing the traffic flow on main roads and providing information for travellers. The “Arrive” project continues working on the solutions developed by “Mobinet” and is an important element of the coopera­­tive traffic manage­­ment policy in the re­­gion of Munich. It aims to find in­­tegrated solutions to present traffic problems. The “MORO” and “SUM” projects address the development of residential and in­­dustrial areas and the related streams of traffic. A MORO work group dealing with the spa­­tial development of the Greater Munich Area seeks to disseminate the idea of sustainability in the development of the Munich region. In addition to exchanging examples of model solutions and agree­­ing on space-saving development prin­­ciples, a detailed area monitoring sys­­tem was established in each of the ten participating municipalities. A project on housing development and mobility (SUM) aims to create favourable conditions for the development of residential areas which comply with en­­­vironmental requirements and are afford­­­able in the long term. The first stage fo­­cuses on regional points of view, examining the potentials of land in terms of developing regional public transport as well as the cost of housing and mo­­bility at individual level, while in the sec­­ond stage, the municipal point of view takes priority, including an analysis of the fis­­cal impacts of the designation of land for housing and follow-up analyses of po­­tential development land and prob­­lems related to transport development. Transport habits will probably change in the future. The conditions in the Me­­t­­ropolitan Region are certainly excellent and can be further developed. This pro­­cess will take some time, though. What is important, however, is that the first steps towards greater future mobility have already been done. The author studied architecture in Ger­many and Flo­­rence and started her ca­­reer as a freelance architect and curator of monuments. She worked in Munich, Re­­gensburg, and finally as head of department in the urban development/planning division of the city of Halle (Saale). Elis­­abeth Merk teaches at the Stuttgart Hoch­­schule für Technik. Since 2007, she has been in charge of the Munich municipal planning and building control office.